Management of the Forest was traditionally associated with management of deer. The Dean became a Royal hunting forest in Norman times. The last record of the monarch actually hunting in the Forest was 1256, but it continued to be an important source of venison for the Royal table for centuries. There was an intricate management structure associated with this - today, the only part which survives is the Court of Verderers. Since Norman times, the Dean has had principally one species of deer - a herd of fallow. In the 13th century, the ratio from venison records was 25 fallow:6 red:1 roe, but red and roe deer were absent by the 16th century. 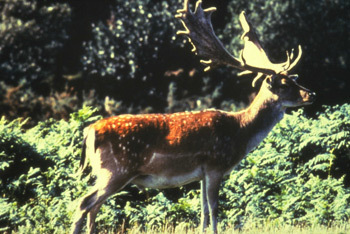 An analysis of the archives reported by Dr C Hart OBE have shown that deer numbers have fluctuated over the centuries. Before foot and mouth disease in 2001, the deer population tended to be more dense in the inclosures which were not subject to sheep browse, but after the removal of all the sheep, the deer spread throughout most of the Dean. The period when there was no public access and the increased food availability because of the lack of sheep, probably combined to cause an observed increase in numbers. A few red deer were introduced in 1842, but the last was killed in 1848. A few red deer were dumped in the Forest in 1999, but have since moved to the SW of the Forest in the Wye Valley. Muntjac and roe deer continue to advance towards the Forest from the east, with known populations now at the edge of the Forest and roe establishing in Blaize Bailey. Deer have an impact on the restocking of clearfelled areas, particularly when using broadleaved species. The impact of forest design planning, where small areas of clearfelling are located throughout the Dean, makes control of deer within these areas very difficult. In some areas, taller tree shelters for protecting young trees have been used, but this is only feasible on a small scale and it offers no protection for the ground flora. Since 2002 deer fencing has been used to protect broadleaf restocking, and has been effective with little adverse comment from the public. In addition to restocking, the implementation of regeneration strategies for the old broadleaf stands is also made difficult because of deer browse on young seedlings. The vision of a healthy forest which is sustainable is dependent on deer populations being kept at an appropriate level. There is an increasing problem with road traffic accidents involving deer. The main problem area used to be the road at the heart of the home range, but the incidence of accidents has increased significantly since the herd spread after foot and mouth disease. Over the past four years, an average of 60 deer are known to have been killed on roads in the Statutory Forest and two stretches of road in the Forest are amongst the worst in Britain for deer road accidents. The fallow deer have traditionally been of high quality ? healthy animals with bucks boasting good heads and there has been a demand for trophy stalking. This has generated local opposition because most of the demand for trophy stalking is from mainland Europeans, but it does offer scope for revenue generation. In the past, three trophy heads were obtained each year in the Forest. Deer should be managed so as to maintain the herd size at its 1999 level, recognising that this will not prevent all detrimental effects on restocked sites. Deer control efforts are focussed on those areas where lower densities are required to assist establishment of tree crops or to facilitate the natural regeneration of woodland. Where it is deemed necessary, deer fencing or tubes will be used. A regular estimate of the population size of fallow deer should be undertaken using night vision equipment on sample transects throughout the Forest. There will be a moratorium on trophy stalking until 2010 when the situation will be reviewed. Means of reducing the incidence of road traffic accidents should be pursued including roadside clearance, additional signage, and promoting a reduced speed limit. The spread of red, roe and muntjac into the Forest must be monitored, and steps should be taken to restrict the spread if appropriate and practical.